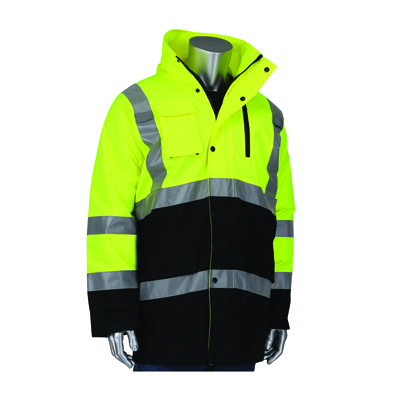 Item #PIP-343-1750-LY-L - WINTER COAT, HI-VIS YELLOW, TYPE R CLASS 3, BLACK BOTTOM, LG. WINTER COAT, HI-VIS YELLOW, TYPE R CLASS 3, BLACK BOTTOM, LG. ANSI Type R Class 3 black bottom coat has a durable 300D polyester shell with taped seams, built-in quilted high loft polyfil insulation, 2" silver reflective tape, hideaway hood, tablet pocket accessible from outside, waterproof zippered chest pocket, radio pocket and mic tabs.